Used thermomix to precook the noodles by adding boiling water and noodles to TM bowl followed the boiled pasta guided recipe. Tipped cooked noodles into a thermoserver to keep warm. Then used the chinese style stir fried vegetables guided recipe to cook vegetables ( left out chillies ). Whilst the Thermomix was cooking the vegetables, mixed sliced pork with cornflour, salt and white pepper. Fried the pork in pan, added seafood and fried altogether until cooked. Flavoured with soy sauce, salt , oyster sauce and sesame oil. 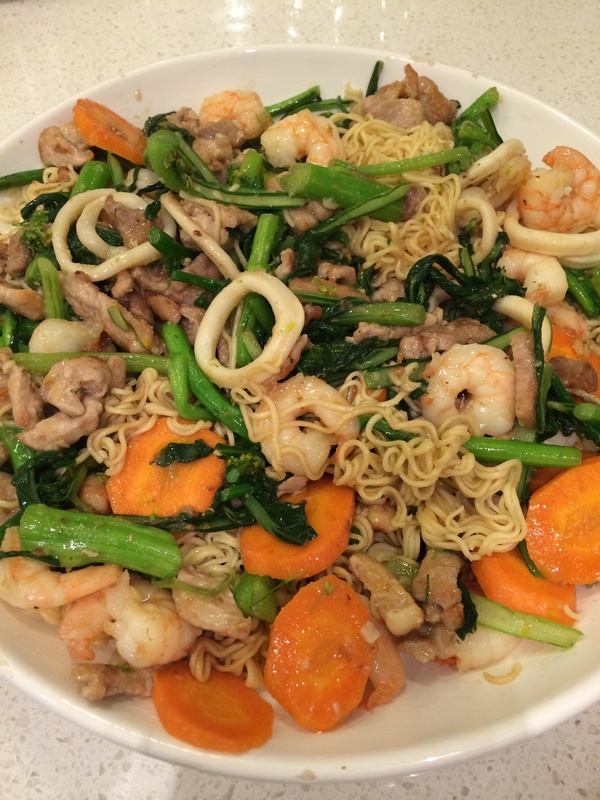 Once the vegetables are cooked, combined with meat and seafood, and tossed into noodles. Notes Can add sesame oil and some toasted sesame seeds. Can add a little chicken stock, water and cornflour to make a sauce with pork and vegetables.